The focus of the Airbus A350 XWB for the travelling public is the concept of space. With a wider fuselage than other aircraft in its class, the A350 is able to offer a wider seat than the Boeing 787 by 1.3cm (0.5in) in a similar configuration. The distance between outside armrests is 220 inches which is 5 inches greater than the nearest competitor. 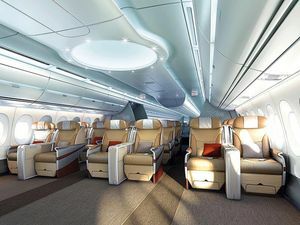 This allows for a very luxurious space for First and Business class travellers as well as those in economy in a nine-seat abreast configuration. 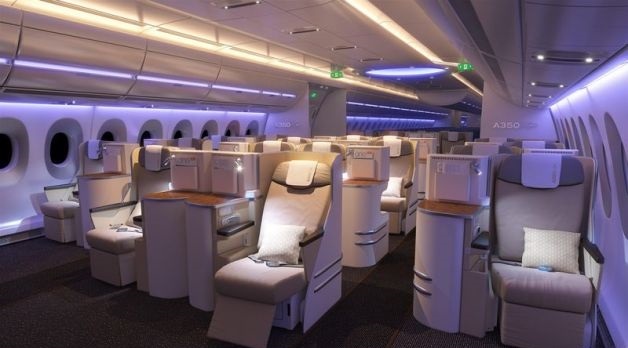 Airbus A350 XWB Business Class option. Airbus A350 XWB Business Class cabin option. The fuselage of the A350 XWB is a constant width between doors 1 to 4, which maximises the usability of space within the cabin allowing the full width of seating to apply to the whole cabin. If you look at the cabin profile head on, it is an ovoid shape, pressed into flatness around the windows area. This adds to the feeling of space with more headroom, and also larger baggage storage space in the overhead lockers. 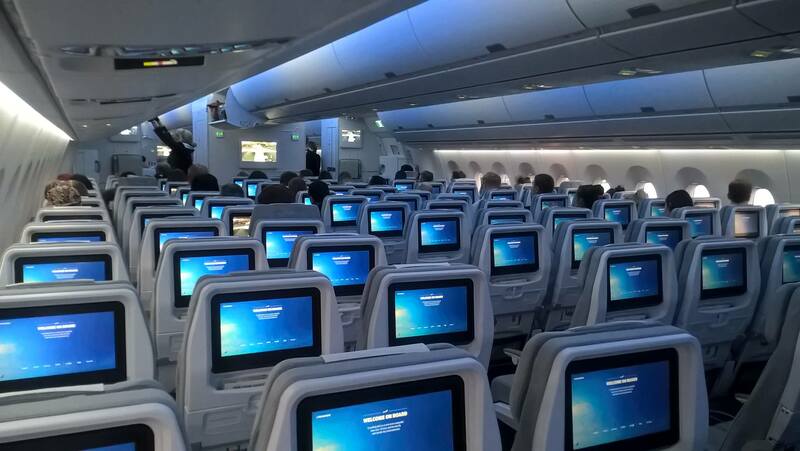 Airbus A350 economy class cabin facing forward. Airbus A350 XWB economy cabin facing rearwards. The feeling of space is further enhanced by the size of the windows which are wider than competitors providing more of a panoramic view, and enabling those passengers not in window seats to also see outside. The new materials and construction methods will enable the cabin to be pressurised to the equivalent pressure found at around 6,000 feet of altitude. 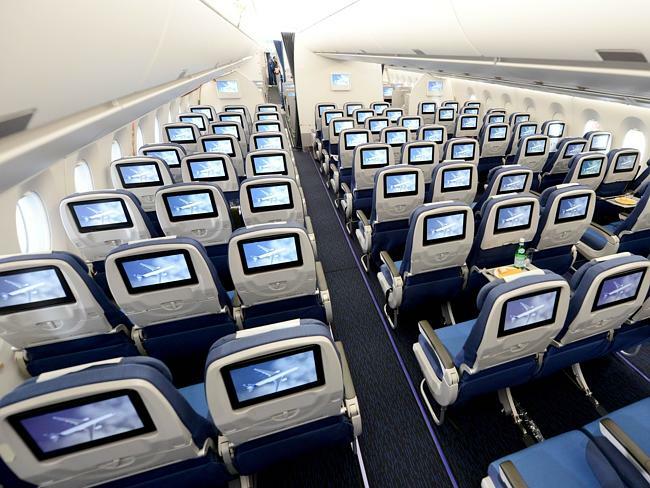 Passengers will also arrive more refreshed as an average humidity of 20% can be maintained. As well as a crew rest area in the ceiling just behind the flight deck for flight crew, there is also one for cabin crew located in the tail which can accommodate six to eight bunks. The area will provide for a space to stand full height to enable easy dressing. 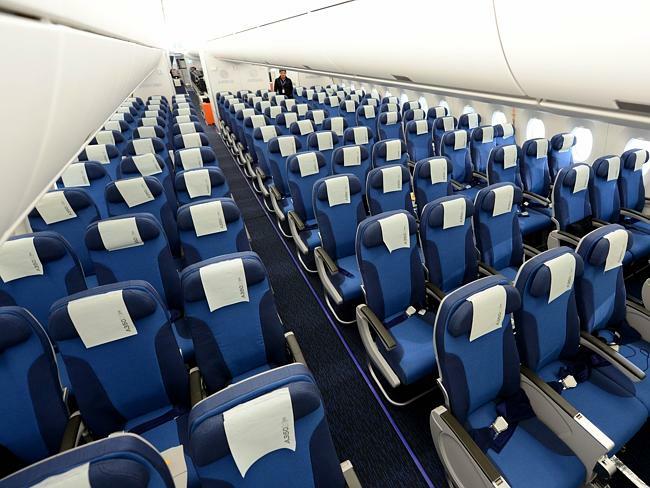 Some example Air A350 cabin configurations. Short to medium haul – Seven abreast. Premium Economy – Eight abreast. High Density Economy – Ten abreast. If there is more you want to learn about this airliner, please visit: A350 XWB Home, A350 XWB Specs, A350 XWB Assembly, A350 XWB Order Book and A350 XWB History. If you have flown on an Airbus A350 service, we would love to hear from you about your thoughts and experience. Furthermore, if you managed to take any Airbus A350 pictures and you want to share them, feel free to add them to our photo album by clicking here. A 340, A350, A380 so nice to travel in. So true, thank you Jasbir.